Optics Technical Information | Optiforms, Inc. When specifying an AR coating, protective coating, or any other high performance coating, you must be fully aware of the full spectral range of your system. While these coatings can significantly improve the performance of the system at the desired wavelength, outside the design range it may decrease the systems performance. The visible spectrum is the portion of the electromagnetic spectrum that is visible to (can be detected by) the human eye. 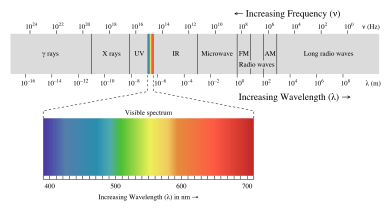 The electromagnetic spectrum in this range of wavelengths is called visible light or simply light. A typical human eye will respond to wavelengths from about 390-750nm. This chart shows the entire electromagnetic spectrum. Visible light is the light the eye can see.